Podium Cue is best in presentation tools available in the market. 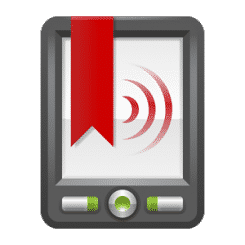 We have developed Podium Cue and Podium Pro apps for our client Communicators. Podium Cue allow users to create a structured and neat documents and notes for presentation or speech. The clean editor helps you write and arrange your talks in a very structured way that keeps you on point. This App help a User to creates and manage the document accordingly and use it at the moment. We have developed this app for iOS platform and user can access in using their iPad. App has simple swipe gestures and snap animations to make moving from point to point incredibly simple. User can create cards for Notes, Documents or Presentation. Podium Cue has mainly two different modes called Story mode and Presentation mode. User can access Presentation Mode that shows the current thought, a title for the next thought, and the main point these thoughts are driving toward. This app is incorporated with local database. Everything can be saved in local database. User can use current card that always has the title of the next card so transitioning between thoughts will always be smooth. User can swipe up and jump to the point of your story or illustration without missing a beat. User can walk away from created notes without ever loosing place or skipping important points. User can share ideas without sacrificing focus or flow. User can access unassuming timer with yellow and red cues that helps with pacing. User can review or edit in a low light setting without distracting others with the bright light of your iPad screen. Client wanted to develop a document-editing tool that allows users to create notes, presentation in real time with swipe animation. This app had to be developed with a robust editing tool to record data in Presentation mode and Story mode. 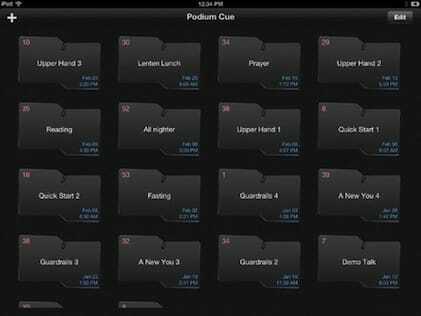 We have developed Podium Cue app with an editor, story illustrator, swipe animation and audio effects. This is the best Presentation and Document Editor tool available in the market. Its supporting app Podium Cue was awarded as a best Speaker app in 2013. 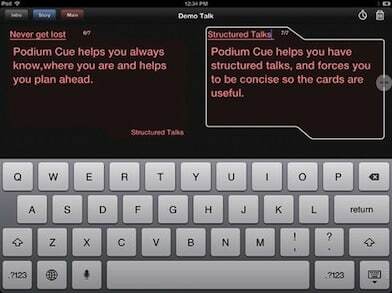 Podium Cue has features like Swipe Animation, Editing Tool, Notes, Story and Presentation Mode.